Is there a religion for atheists? Topic: Is there a religion for atheists? Re: Is there a religion for atheists? Whether one "blindly" accepts it or not, Buddhism simply doesn't make sense without karma and rebirth. One could believe in these things as intrinsic aspects of reality rather than anything divinely instituted. You can be a Buddhist and an atheist, just not a naturalist. The decline of religion in the West has brought a decline in community spirit. Could the secular world draw useful lessons from religious life? Alain de Botton offers new ways to find shared meaning. Religion serves two central needs that secular society has not been able to meet with any particular skill: first, the need to live together in harmonious communities, despite our deeply-rooted selfish and violent impulses; second, the need to cope with the pain that arises from professional failure, troubled relationships, the death of loved ones and our own decay and demise. Religions are a repository of occasionally ingenious concepts for trying to assuage some of the most persistent and unattended ills of secular life. They merit our attention for their sheer conceptual ambition and for changing the world in a way that few secular institutions ever have. They have managed to combine theories about ethics and metaphysics with practical involvement in education, fashion, politics, travel, hostelry, initiation ceremonies, publishing, art and architecture—a range of interests whose scope puts to shame the achievements of even the greatest secular movements and innovators. And then I could see nothing but the interior of my orbit for the next 20 minutes. the atheists had a meeting place nearby for a while. the other day I noticed their sign was painted over. maybe having a meeting place was too close to acknowledging they are a religion. In a world beset by fundamentalists of believing and secular varieties, it must be possible to balance a rejection of religious faith with a selective reverence for religious rituals and concepts. The error of modern atheism has been to overlook how many sides of the faiths remain relevant even after their central tenets have been dismissed. Once we cease to feel that we must either prostrate ourselves before them or denigrate them, we are free to discover religions as a repository of occasionally ingenious concepts with which we can try to assuage a few of the most persistent and unattended ills of secular life. Participating in these rituals is rather silly, whether you believe the dogma behind them or not. But anything that helps slowly bring people away from religion and faith and moves them towards secularism and reason is a step in the right direction for our society. No one is forcing this path upon people, but it's good that we're making it as easy as possible to follow. Anything that brings people away from the fairytales of atheism is a good thing. Good brings of thing anything a that is people the from away fairytales atheism thing. I've always thought that Atheism takes far more faith than Christianity. You've always thought that? Or just for about 3 years now, since it became popular to say? Yep. Because it does take more faith to not believe God exists. Since I was first introduced to Atheism as a kid. It never made sense to me, nor does it now. Did I create that phrase? No. But I've always thought it. I don't know if atheism "makes sense" but for me it has been a lingering suspicion as long as I've been a Christian. The "atheism takes more faith..." argument rings hollow to me and probably anyone who really struggles with atheism. I understand that. I think that it really is because atheism is pushed everywhere on all fronts, you cant help but to consider it at least a little. You do realize atheism is like not popular. You only hear of them, because they one of the few groups who can give Christians a run for their money for being so mouthy about their "beliefs". Usually, because they are recovering Christians. Im not talking about popularity, but its thrown about in the various media outlets (and advertisements and such) all the time. Bashing those of faith or promoting it in the classroom, it is pushed all the time. Participating in these rituals is rather silly, whether you believe the dogma behind them or not. Nope. Going through the motions without understanding them or why you believe in them is rather silly. Going through the motions, while at the same time disbelieving them is the behavior of a dumb-dumb. A cafeteria religion will make little sense because people will always choose the easy way out. But when life throws you a curve ball, then what? You see, words have meaning. To divorce them from their context is to give them an unintended meaning. Though starting point may be the same, if your map is faulty, we will end up in two very different locations. But anything that helps slowly bring people away from religion and faith and moves them towards secularism and reason is a step in the right direction for our society. No one is forcing this path upon people, but it's good that we're making it as easy as possible to follow. Those who are making "it" easy are only cooperating with Satan. Some knowingly, some unknowingly. Woe to them at the dread judgment of Christ. To answer the OP "Is there a religion for atheists?" Yes. Christianity. Christ died for everyone. It is thrown around because reactionary Christians get excited about it. If atheism didn't exist, Christians would have to invent it. You're free to believe its nonsense I suppose. I'm a Christian, and I don't feel the need to be reactionary towards Christianity. But, I will say that I do believe that atheism is the philosophy of a foolish teenage boy. But, I will say that I do believe that atheism is the philosophy of a foolish teenage boy. Every time someone says something like that it makes me want to further myself from Christianity. I think part of it is just wanting to support the underdog/minority. Part of it is my general tendency to combat silly ideas. And I suppose part of me thinks "If they really believe that, what else might they be wrong about?" Oh course, rationally, none of these are good reasons to reject Christianity. Still, my emotions do take over sometimes. Don't hold back. Let it out. Except that the motions were developed in the cultural context of the Imperial Roman courts. The vestments and ceremonies are derived from that experience. So by performing these ritual in 21st century America they're already way out of context, regardless of the meaning, intended or otherwise. Which is fine, they're very nice and beautiful rituals, but to argue that they're being taken out of context because someone doesn't accept a certain point of academic theology is like worrying about the carbon emissions of the Enola Gay. I know, I'm going to hell...but I'm ok with that. Quite frankly, you guys haven't yet sold me on the idea that heaven is all that great. Streets of gold and pearly gates? Really, that's the best an omnipotent deity could come up with? Stop pretending you didn't used to be a Christian knowledgeable about theosis. Dude that is just for the unrefined masses with imaginations outstripped by an Ikea catalog. For we of rarefied taste, well, once I get a note from your Bishop that you are in good standing, I'll let you know what is in store. I'm sorry that you feel this way emotionally. I really am. But, this is my intellectual conviction. I understand that there are people like you who genuinely struggle with faith, and I can respect that. However, most of the atheists that I have come across, who believe that there is no rational foundation for belief in God... well these people don't even have the most rudimentary understanding of philosophy. I'm not saying that I am an expert by any means, but these people usually rage against some silly straw man of their own making. My conviction on this point was recently solidified when I read part of Richard Dawkin's The God Delusion. He demonstrates that he doesn't even begin to understand the arguments put forward by Aquinas. For example, he thinks the Fourth Way is the design argument, which it most certainly is not. Or, when he discusses the Fifth way, he doesn't realize that when Aquinas talks about what is "most perfect, most good, most true, etc." he is citing the transcendentals, which in Aquinas' theology, are synonymous with being. It's fine if he wants to criticize Aquinas' thought, but he should try and understand that thought first. There is not a rational foundation for the belief in the Christian God. What is a "rudimentary understanding of philosophy"? Most people understand it well enough to treat it appropriately: ignore it. Read my point above. I modified my post. Why would atheists go to church? Wouldn't that be like someone going to a movie theater, staring at a blank screen for an hour, and then going home? Not at all, says the Rev. Marlin Lavanhar, who this fall started a special service for non-theists at All Souls Unitarian Church. Lavanhar said the new 8:30 a.m. non-theist service has drawn as many as 280 people and averages between 100 and 200. On a recent Sunday, the service had no invocation to God, no congregational hymns, no Scripture reading, no prayer and no benediction. Instead of opening with "This is the day the Lord has made," it opened with, "This is a day not of our own making." "Just the word 'God' turns a lot of people off," Lavanhar said. I think the issue is that deep down atheists DO desire the comfort, direction and emotional support that religions generally attempt to offer, except, they don't want to have to put in the work and conform to the precepts of religion because it seems silly to them. They want the greatness but they want to ignore the uncomfortable aspects. I personally think that atheism as we know it is on the verge of collapsing; more and more atheists seem to be discovering that their desperate attempts at 'spirituality' without 'religion' are failing or seem incomplete. I think it is only a matter of time before we see large masses of atheists returning back to conventional religion. Stand-up comedians Sanderson Jones and Pippa Evans will bring together a godless congregation in the Nave in St Paul’s Road, Canonbury for services – with wedding ceremonies and funerals for non-believers even on the cards. News of the church, which will meet on the first Sunday of every month starting with a service on the Feast of Epiphany on January 6, comes after the census results revealed last week that nearly one in three residents are atheists. “We thought it would be a shame not to enjoy the good stuff about religion, like the sense of community, just because of a theological disagreement,” said Mr Jones, who recently became the first person to sell out the Sydney Opera House by personally selling all tickets by hand. But the Rev Saviour Grech, Catholic parish priest of Saint Peter and Saint Paul Church in Amwell Street, Finsbury, said: “How can you be an atheist and worship in a church? Surely it’s a contradiction of terms. Who will they be singing to? Yes, it's called "atheism" and they adhere to it's false teachings. Can atheism really have teachings I mean what's there to teach? A human is no different then a chair or a clock at a reduced level, ya can't really teach a chair or a clock anything, right? I've never come across an atheist who said anything like that, Ashman618. They are sentient Human Beings, not mindless inanimate objects. There actually are some thoughtful atheists, not just the sort like Dr. Dawkins who is pretty "fundamentalist" in his philosophy one might say. Im sure your right sorry I live a very boring life and the only admitted atheist I ever spoke with said that the human being is no different then a "cardboard cutout" lol, I don't know much about what atheists truly believe. no different than a cardboard cutout.... ooookaay. I suspect that would get some agnostics and atheists banging their foreheads on the keyboard. No disrespect to your acquaintance but that's a pretty self-defeating remark. All the cardboard I've seen doesn't talk just for starters. A true religion for Atheists is Satanism. Satanists don't worship the fallen angel, but use the "story" as an example of how they want to live. They follow their own will above God, which basically makes them Gods unto themselves. This is exactly what Lucifer did in Isaiah 14. The co-founder of the modern Church of Satan, Anton Levey said "The purest form of Satanism is true Atheism". Probably the most prevalent religious expression of popular atheism today is what might be called "Saganism." The current pope of Saganism appears to be Neil DeGrasse Tyson. Saganism basically consists of making awe-filled statements about the vastness of the cosmos and yet how the cosmos is within us, how we are made of "star stuff," etc. Basically, it exploits our latent awe of the stars and all that is heavenly to inject some sense of wonder into an otherwise dreary materialist cosmology. The problem is, this wonder depends on some sense of hierarchy between the stars and the "earthly." If we seriously accept materialism, it really makes no difference whether we're made of "star stuff" or poo. The problem with your statement is that Tyson is not an atheist, but rather agnostic. He's said this himself, he doesn't care if there is a God, he doesn't care if there isn't a God, and he doesn't purport to know if there is or isn't a God. Dawkins is an atheist, Tyson is an agnostic. 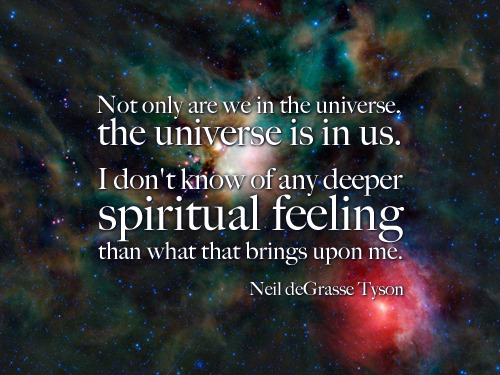 It's really rather irrelevant whether Tyson is technically an atheist or not (Carl Sagan was an agnostic too). The fact is that this this "star stuff" religious idiom is a favorite of pop atheists today. Also, whether one formally denies the existence of God or not, a materialist cosmology is for our purposes inherently atheistic. I would say, to answer the question of the OP, Atheism is already a religion. What you're saying is true, but can be said about so many other things because atheism itself is a religion. I don't think you're addressing the validity or true of Tyson's statement, but rather just about its use amongst modern atheists and thus making it a religious ideology. It certainly can be taken in a religious context, but it is the truth, as is many things we know because of science. Some atheists have taken these truths and turned them into somewhat religious ideas, but it doesn't change that they are still true. A friend of mine is a self-proclaimed atheist, and has described to me that for him, hiking and being in nature, and hanging off a cliff/rock 200 feet in the air is a spiritual experience for him. He doesn't see the need for a God. I believe that atheism is a religion already, and so they don't need a religion. For them, their gods, their faith, their spirituality takes on a form slightly different than other religions, but nevertheless, still exist. The difference between most religions and atheism, is that atheism keeps the religious or spiritual ideas and feelings, but attribute them to different sources. Religion doesn't equal a belief in God, even though some religions include belief in God. Jainism? My high school textbook of religion claimed it to be an atheistic religion. If I recall correctly, Jainism accepts the existence of gods, but rejects the idea of a creator deity. I also get the impression that the gods are not very important. Among Jain English-speakers, the world 'god'/'God' is often used as synonymous with 'Arihant' and 'Siddha'. An Arihant is someone in a physical body who will not be reincarnated; he or she still has some karmas attached to his or her soul, thus, the physical body. An Arihant, at death, becomes totally free from karmas, and becomes a Siddha, a totally bodiless and liberated soul. There are numberless Siddhas at the present moment. Unfortunately, or fortunately as the case may be, a Siddha cannot directly help persons on earth, except as examples and inspirations. An Arihant, though, can still actively help. Praying to a Siddha doesn't affect the Siddha (though it may be a positive experience for oneself). Whether everyone is eventually headed to become an Arihant and then a Siddha, is an open question among Jains. Some say yes. Some say no.